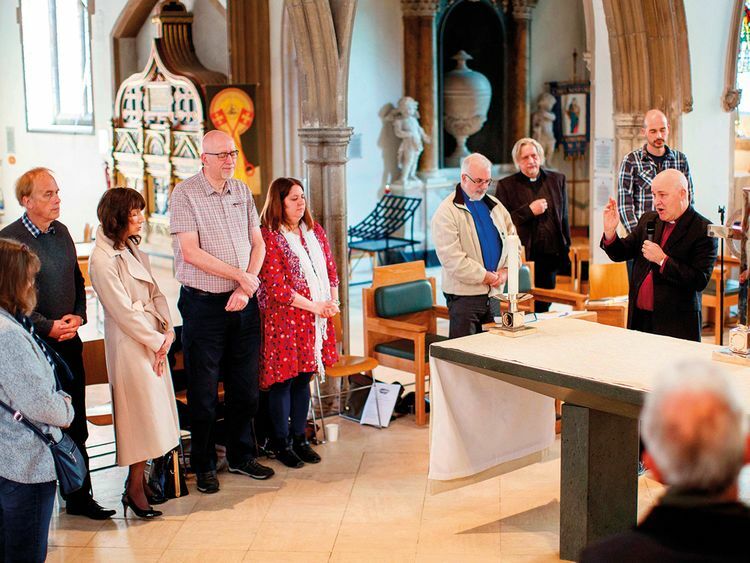 CHELMSFORD: With Britain’s political world in chaos over Brexit, Christians across the country this weekend took part in special prayer sessions hoping for some divine help in healing bitter Brexit divisions. “It doesn’t matter whether you voted leave or remain, we’re still one humanity, one nation,” Stephen Cottrell, Bishop of Chelmsford, told AFP after imploring his congregation to heal the rift. The Church of England has promoted the initiative as “tea and prayer drop-ins” — combining two of its most well-known sources of comfort. Despite a sharp decline in church attendance, Cottrell believes faith still has the power to unite the country after Brexit. “It’s no good the church standing on the sidelines, waving our hands saying ‘why doesn’t everybody just love each other’, what we’ve got to do is show what that love looks like in action,” he said. Worshipper Angela Sadler, 65, said the church needed to play a larger role in helping resolve the broader issues surrounding the crisis. “It’s quite difficult for the church because the church needs to be seen as a non-political body, which is correct, but I also think ... we need to see more of God’s love,” she said. As sunlight flooded through the ornate stained glass windows of Chelmsford Cathedral, Cottrell told the group of around 20 worshippers that the values of the church could be expressed through a return to “British values” that were “rooted in the Christian tradition”. As the floor was opened to parishioners, one woman called for help in being “patient”, something she was struggling with in the inescapable and ever-growing crisis. Another echoed the bishop’s call for a return to “traditional values”, although the definition of what those values are is one of many debates swirling around Brexit, highlighting the challenges in uniting the country around a common message. “It’s going to be a long process, there’s no easy solution to unity,” said Sadler’s husband Stuart, 66. Three years from a hugely divisive referendum over Britain’s EU membership in which the Leave vote won by 52 per cent, Anglican leaders have called for communities across the country “to join together in conversation and prayer”. The result in Chelmsford was about the same as the national average, with Leave winning by 52.8 per cent. Angela Stuart said she felt “compelled” to come to the service, “to stand amongst others that believe the same”. “We are a great nation and we do need the Lord in this nation, and prayer is so important in bringing that forward,” she said. A recent survey found that around four in 10 British adults have been left feeling powerless, angry or worried by Brexit, exposing the mental toll being taken on citizens. The early-morning service began with a reading of the parable of the Pharisee and the tax collector from Luke’s gospel, chosen as a warning against the divisiveness of moral hubris. “For all those who exalt themselves will be humbled, and those who humble themselves will be exalted,” the parable ends. “The reading is about how we define ourselves, we’ve got to stop defining ourselves by whether we voted leave or remain,” said Cottrell, who also sits in the parliament’s House of Lords. Retired policeman David Gilbey, 56, said this could only be achieved through faith, recalling a Bible passage in which Jesus tells his followers to be united, saying: “be one, just as I am one with my Father”. “Unless we have that unity with our heavenly Father, we haven’t got anything to grip onto,” he warned.